Flag of Scotland: There is more than one story of how the Saltire, believed to be the oldest flag in Europe, became our flag. This translation is possibly the most common. St Andrew, was one of the Apostles crucified by the Romans. He refused to be nailed to a cross the same shape as that of Jesus, so he was crucified on a diagonal cross. He was destined to become our patron saint. The word ‘Saltire’ is derived from the French word ‘sauteur’ meaning ‘jumper’. This is in reference to horse jumping, and the connection is the resemblance of the crossed poles fences used in horse jumping competitions, to that of a diagonal cross. After the crucifixion, St Regulus is said to have had a vision asking him to take the bones of St Andrew to a distant, far off land. This he duly did, and St Andrew’s remains arrived in Scotland, in the town that is now known as St Andrews. It is believed the Saltire became the national flag of Scotland in the year 832AD, in the sky above a battlefield near the village of Athelstaneford in East Lothian. This time the Scots were the invaders, as East Lothian was part of the kingdom of Northumbria. On the eve of the battle, King Angus, who was leading the Scots and Picts, is reported to have had a vision in which St Andrew appeared to him, and assured him of victory. When they Arrived at the battlefield the next day, the Scots and the Picts were heavily outnumbered, and Angus and the whole Scots army knelt down to pray to St Andrew for courage and strength. They vowed that if they emerged victorious, He would become our patron saint, and his cross would become the national flag of Scotland. As the forces of Scotland and England faced each other, about to commence battle, a strange thing happened. White clouds formed the shape of a diagonal cross, set against the background of the light blue sky. Inspired, the Scots went on to victory when the English leader Aethelstan was killed and the Northumbrians fled. 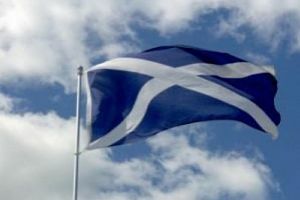 The Saltire became our flag, and St Andrew our patron saint. Scottish soldiers wore the Saltire on their bonnets and tunics for identification on the battlefield. In the kirkyard of Athelstaneford Parish Kirk, is a memorial marking the ‘Battle of the Saltire’ depicting the battlefield, the two armies and the sky above them. The crucified image of St Andrew appeared in the seal of Scotland in 1289, but following the Union of the Parliaments in 1707 the use of the Saltire was rare until there was a resurgence in its use in the 20th century. Now recognised legally as Scotland’s national flag, it is used by Scottish teams in international competitions and it’s flown from public buildings, either on it’s own, or side by side with the Union Flag. When it was incorporated in the union flag the saltire was shown in a darker navy blue and now many flag makers have adopted this colour. In 1936 the Saltire Society was founded to help to preserve and enhance Scottish society and culture, and more recently embassies of the United Kingdom have flown the Saltire on 30th November each year, to mark St Andrew’s Day. The Lion Rampant (pictured above, on the left) is sometimes mistakenly thought to be the flag of Scotland, but it is in actual fact, the flag of the Monarch of Scotland.